Ever since Dropbox was first released in 2008, the increasingly popular web service has brought users a newfound convenience when it comes to file sharing. The software lets users sync up to 2GB of data onto Dropbox’s dedicated servers for free, allowing them to access all of their information from anywhere that has an Internet connection simply by logging into their Dropbox accounts. This service is understandably very handy for both casual users and businesses alike, as it enables instant file sharing without the need of a flashdrive. Now, it appears that developers are looking for even more ways to file sharing and hosting even more convenient. Last week, Dropbox sharing got an upgrade that will enable users to share files and folders as links, which means that shared files can be viewed and played directly from your browser. One new feature that users will be able to see after installing the upgrade is a new “Linked Items” tab, which was created on the sharing page for users to allow access to all created links from one location. 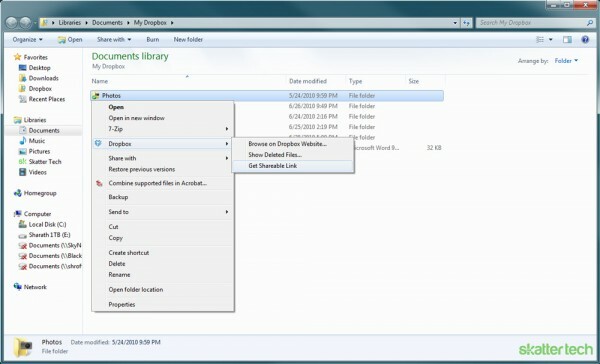 You can also make shared folder links, which can be viewed from both tabs. Under this upgrade, users will be able share music, pictures, office files, pdf files, and code files, each of which will be displayed using custom viewers. Unfortunately, the new sharing feature is currently in its beta and will only work with Dropbox clients 0.8 and above. The company does intend to release a more complete version, however, which will have password protection and expiration, as well as some other unnamed features. As someone who creates musical content and shares it with different people, this feature could not be more convenient. I tried out the new feature for myself and found it to be just as fast and easy to use as Dropbox’s primary syncing feature. I tested out the feature by creating links to both pictures and various MP3 files and was impressed with how fast the process was. A folder full of audio files was instantly available to play in a queue with the new embedded Dropbox audio player. Now, anytime I want to show or transfer my music to someone, all I have to do is access the small library of linked songs in the Linked Items tab. I cannot stress enough how convenient it is to be able to transfer and share files with peers in the same amount of time it takes to post a single link.